2016 Yamaha SRViper L-TX SE, 2016 Yamaha SRViper L-TX SE Excels everywhere conforms to no one. Features may include: NEW FOX FLOAT 3 EVOL Front Shocks The latest generation in air shock technology from FOX - the new FLOAT 3 EVOL series shock features an improved piston and valving stack for more control and better performance in a wider range of terrain. The patented EVOL chamber is a secondary air-spring chamber that provides anti-bottoming control and reduces unwanted vehicle roll. HPG Rear Shocks Premium High Pressure Gas shocks are found at both the front and rear arms of the rear suspension - tuned for premium control and comfort with incredible fade resistance. 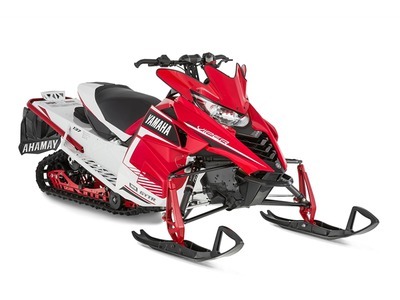 The shocks are also serviceable, allowing your authorized Yamaha dealer to recharge and refresh them for consistent performance season after season Tuner 2 Skis Our Deep Keel Tuner 2 Skis are engineered specifically for the SRV Chassis and the unique characteristics of the Viper. They deliver reduced ski-pressure and near effortless steering; and the dual keel design delivers an assured bite in the corners with reduced darting. The design also allows you to customize the handling and feel of your sled with easy to change carbide runners in a variety of insert lengths for the inner and outer keel. Dual Shock SR 137 Rear Suspension The drop-link style Dual Shock SR 137 rear suspension is the cumulative result of years of punishment and development in snocross and cross-country competition. This crossover suspension offers premium bump compliance and control on trail, additional bump bridging capabilities thanks to its stretched length, and additional floatation and traction for occasional off-trail use. The SR 137 is a coupled suspension that utilizes a unique sliding front arm mount. With up to half-inch of movement at the front arm slot , the system allows the SR 137 to deliver controlled (reduced) ski-lift during acceleration while still retaining front arm bump compliance. YVXC Clutching Featuring Yamaha drive and driven clutching, the YVXC system delivers smooth engagement, instant acceleration, fast reacting backshift, and cool operating temperatures for a long belt life. The YVXC clutch system delivers Yamaha s hallmark smooth power delivery, responsive engine feel and unmatched quality. All Yamaha pictures are kind of Yamaha HD motorcycles picture was taken, including motor fuel gauge, engine, engine mounts, tires, fuel tank, the car handles, lights and so on, 2016 Yamaha SRViper L-TX SE full-screen viewing,2016 Yamaha Motorcycles today Price: $11,900 .